Do you know exactly why Walsh (and his coaches) would have wanted certain routes thrown to a particular direction (i.e. Outs to the left and Ins to the right)? The out and the hitch look exactly the same in the first diagram. I was thinking that maybe the TE was running a hitch, but he looked like he was running a slant pattern. The diagram I guess is a bit misleading; I'll fix it. The hitch is where the receiver runs five steps (three big, two small) upfield to about 5-6 yards and just turns around, to the inside, towards the -- the QB already has the ball in the air. The out is a quick outbreaking route at five yards. I didn't mean for both sides to represent one route, I had both receivers showing both the hitch (inside) and the out (outside). They are really the same play -- a quick outside throw before the flat defender (linebacker, strong safety) can get out to cover it -- the only difference is how you want to work against the defensive back's leverage. But when I get a chance I'll fix the diagram. Sorry if that was misleading. Pilot: Tom has a good answer. I wouldn't take those notes as "never, ever!" statements, but as rules of thumb. And in that sense, they hold true to most passing offenses today. Good stuff as always. I do have a question about the slant-flat combo, though: when Walsh says that, if "[t]hrowing strongside, you should use dropback and weak flow," uh... I was following him right up to the "and" part. What's "flow" in this context? Also, as a side note, I like to run slant as a 3-step route for the receivers -- three big and plant and break on the 3rd step. 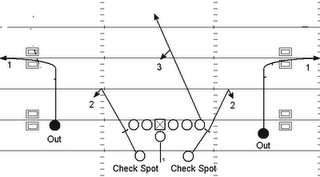 Walsh says here 5 to 7 steps which strikes me as more of a "glance" or skinny post route. Same combination though really. Thanks, Chris -- and good spot on the 5-to-7-step thing; I was picturing a three-step slant myself, and I wasn't reading closely enough to pick up on that. You're right when you say that using a 5-to-7-step stem makes it less of a slant and more of a skinny post, but I think there's a lot to be said for using that longer stem on the slant. I figure if you're trying to disguise some of your routes, why not disguise all of 'em? Why not just make six yards the breaking point for everything INCLUDING the speed-out? That's not a rhetorical question, by the way, although it sounds like one. I'm pretty sure there IS a hidden downside to that or else everyone would do it. I just can't see what it /is/, so uh... help a brother out? The main item he seemed to address in his idea of slants one way and outs the other dealt with the football spin. Got kids to try one hand catching on both routes and Walsh's directional preference works for the directions he tags on one handed attempts every time. The ball will at least spin back to the frame of your arms and body for the preferences he lists. Now for other routes he notes the difference strong/weak because a safety or LB rotation could drastically change the progression read coming open. Splits differences are very important. When we went with splits the preference was to start far outside so CB wre on islands and we could include an interior slant stem to bait the sluggo if corners looked into the backfield too much. Does coach Walsh ever indicate splits as being effective for the run game? Were certain runs paired to tight splits the same way certain pass routes were? That could be very important.
" Hop inside and come under control in hole." I need some tech specifics there, please. What of coaching 'hop' and why is it taught? Just an allusion to quickness or is an actual method at place with that choice of words? Timed routes taken on tight situations(3rd and 4, 2nd and 6) and loose ones(1st and ten) why the discrepancy? I thought the first down was a loose cover down and the third down one is obviously tight. Walsh likes running on second and six a lot if they had not done so the play prior? Is he coaching his own tendencies into how the defense would respond? "Throw square out into short field and away from rotation." This couples with throwing away from strong. Walsh is checking tendencies to shift or rotate zone to strength IMO. This is a read progression. Do you count where they go or cue shoulder/chest(numbers) to accelerate a passer read? I don't like using hands to determine it because EVERY target will wave his hands like he's open, very bad habit at lower levels. They need actual items in technique as part of the read to signal their action. What are they? "WR always keep elbows and arms in running position. Just before you break, drop head and dig (pump hands)." Explain the mechanics in this at the end of his route, dropping the head to sell a move later, or for leverage? The "dig" tech is used to emphasize low push offs out of breaks? Pushing low is less likely to draw a flag and it does create separation where they cannot jump the route by getting their hips turned with you. When Walsh refers to weak flow (slant) he is talking about the backs. I.E. the 70 series in the West Coast Offense run with an offset half back free releasing weak and a full back blocking to the weakside. The Strong Guard would have a double read (unless used with 200/300 jet which was a slide protection. I assume this is similar to a burst technique. Anyone else? Walsh preferred for outs to be aimed "through the earhole" of the target's helmet so the ball stays high in their line of sight. 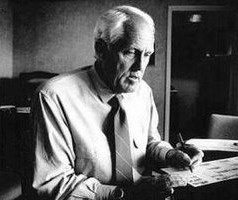 Walsh (like Dan Henning of the Dolphins, & Vince Lombardi of the Packers) PREFERRED in-breaking routes to the right, & out-breaking routes to the left BECAUSE of "spin factors" (drift of ball). I.E. - with a right handed passer throwing in-breaking routes to the right - the ball spins RIGHT (INTO the receiver). On out-breaking routes to the left - the ball spins RIGHT (INTO the receiver). On DEEP passes - better to right BECAUSE ball will drift (to the RIGHT)& out of bounds (rather than back into the playing field) IF the reveiver can't get it (porevents picks). ALL of this is detailed in Bart Starr's great book:"QUARTERBACKING" by Bartr Starr. Can be found on ABEBOOKS.com. The REASON Walsh preferred certain passes to be thrown to the right, & others to the left, was because of "SPIN FACTORS" of the ball. With a right handed passer - the ball spins (drifts) to the RIGHT. Vice-versa with a left handed passer. Walsh PREFERRED thge ball to spin INTO the receiver, rather than away from him. Lombardi was BIG on this also (see Bart Starr's book - "QUARTERBACKING" - with a chapter devoted to this porinciple! There is a formula (once used by the great Bill Walsh - at Stanford U. & the 49ers) - that can be used to determine the effective LENGTH of any pass a particular QB CAN throw (on a "frozen rope"). Needed (particularly in YOUTH ball) in setting UP a pass offense. (NOW GET SOMEONE WHO KNOWS HIS MATH): The simple Pythagorean theorem informs us that A (squared) + B (squared) = C (squared). From our parameters we determine the following information: receiver split (squared) + drop depth + route depth (squared) = length of pass (squared)! Understand that the drop depth is calculated from the LOS not from where the QB is standing. Therefore, the QB should never stand with his toes at the LOS but rather 1-1.5 yards from the LOS. Consequently, 17 (squared) + 7+12 (squared) = C (squared). Therefore, 289+361 = C (squared) is 25.5 yards. In other words, the length of the pass is approximately 25.5 yards - this length will vary for a variety of reasons and could be as long as 32 yards depending on the split or depth of receiver. It becomes obvious that the less arm strength the QB HAS - the closer the receiver must align, and/or the route must be shortened to various degrees. Heve filled out TWO of these in past several days - why haven't they appeared?